In late June, I set off with 5 like minded riders for a 5 day trip to the Alps. 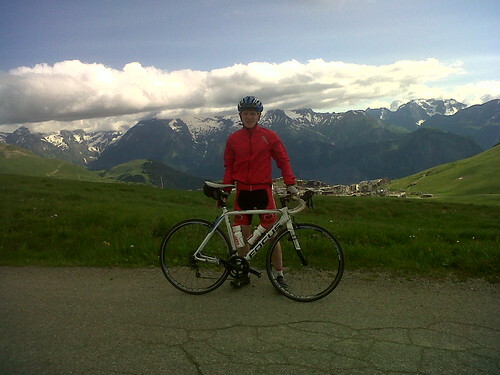 The first Alpine climb we tackled was Alpe d'Huez. Here's a summary of how it went. After a quick look at the profile and Hattie's local knowledge I knew the first 2km (the first 4 hairpins) was going to be the steepest section; so inevitably Mat lead us into the first 500m far too fast and he quickly blew out. Fortunately for the girls and Sam, they'd been given a head start, so the only casualties on the lower slopes were Mat and Tom H. Henry and I quickly settled into a very smooth rhythm. I nudged my gears down to my new smallest ratio of 34-28; two weeks previous to this I would have been grinding it out with 34-22 which I am definitely not suited to. I'd heard that spinning a low gear was preferable for some people and I discovered I fit right into that category. High cadence really does suit me. I've never climbed so well before in my life, and what a better place than Alpe d'Huez to prove the legs are on good form! Henry was a bit jealous of my low gear ratio, and Sam said I was a 'softy' for caving to a compact chainset (or words to that effect). Having a team mate really helped to keep an even pace up the climb. As can be seen from the profile, the gradient doesn't change much, and it was a gentle relief to share drafting duties with Henry. Despite there being very little benefit from drafting when travelling at 12kph (7.5mph), I really appreciated having someone to hide behind when small gusts of wind tried to mess up my rhythm. Besides, it's always easier to push harder when you're riding with someone else, simply because I had no intention of letting him get to the top before me. The wide flat hairpins provided small respite before the road returned to its punishing 8% gradient. On a day where the sun was just breaking through in the early afternoon, the temperature was ideal for some lung bursting climbing and to top it off, the views were phenomenal. 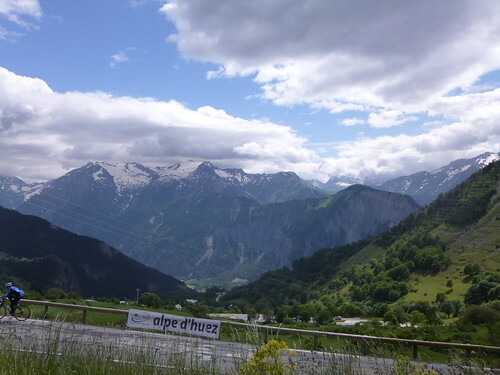 3-4km from the summit Alpe d'Huez village comes into view 300-350m vertically above your current position on the road. It's at this point that I simply had to focus on the next 100m of road ahead of me and try not to stare too bleakly at my bike computer's elevation reading. When the going gets tough, the tough get going. Henry and I certainly embraced this, pushing hard as the climb opened up and there were no longer any trees to shelter from the blustery wind. Rounding bend 21 with 500m still to go until the 'podium', Henry kicked. It was at this moment that I realised I really was on the edge, with no acceleration left, I had to watch him gain 10m, then 20 as he pulled out a 20 second advantage by the top of the climb. I crested in a little under 59mins, which was to be my best performance of the trip (1:01:27 for 2nd attempt on last day). On reaching "the podium", I realised the road continued upwards further, so we added another 3km to our ride up the mountain to an area with an abundance of ski lifts. At 2000m we called it a day and rolled back down to find our team mates. We had the descent via Villard-Reculas back to Vaujany all to ourselves, which was just as well considering the first 5km after turning off the Alpe road was rather narrow. We soon discovered why our Chalet had been so cheap at this time of year... it was perched 2km up a 10% climb. Less than ideal at the end of any ride, let alone an leg sapping alpine ride. That said, I really my legs really were feeling good, so on reaching the chalet, I passed it and trundled up the hill a further 3km to La Villette for no particular reason other than I guess to prove to myself that my legs could handle more climbing. A good sign for the following days. Hopefully I haven't used up my reserves too quickly. Overall it was a tough, but rewarding day of riding, and I'm definitely looking forward to tackling some more Cols as the week continues. Posted by Tom Mowbray on July 29th, 2013. Some may think it "soft" to put on climbing gears; others would call it "sensible". It's interesting how the gradient is stiff right from the start. That's like putting temptation smack dab in the middle of the path; it sounds like the first 500 meters soaked up all the adrenalin. Congratulations on completing an epic climb – I'm jealous of the climb and the views. I'm also sensible – I'm a big fan of low gears. Hey, I have a 28T on my bike that has a compact chainset. I'm thinking of going to a 30T next time! I've never done a sustained climb anything like Alpe d'Huez. Well done, that man. Yes, well done. My first 'Alpine' climb was Col du Tourmalet last year and I really enjoyed it. I think the average gradient is about 7.5% and I rode it on my touring bike with the luxury of 26T on the chainset and 34T on the cassette, but I don't know whether I ever used that lowest gear. I just plodded up nice and slow and stopped for a sip of tea and some apple pie a couple of times. There is a definite sense of achievement doing these famous climbs (riding over the names of the 'greats' can be a little intimidating but I won't be as scared in future). Well done Tom. I've not done any of the epic climbs in the Alps or Pyrenees but I'd certainly like to one day. altho I'd prefer a mug to a sip! Well done! I must say, I really like the idea of finding some proper 'big' climbs – of the size that we can't fit in this bijou country of ours, the sort that take the best part of a day to get up. And I am sure there are those who'd testify that I'm no stranger to hills in this country, having climbed the highest, hardest and steepest I can find (not yet done them all, but I'm working on it.) But I'm currently thinking it's time I swapped my 26-32 lowest gear for the 24-34 that I'm more used to – I can't remember the last time I rode a cassette with fewer than 32 teeth!